It's a project that researchers said could help ensure safe disposal of nuclear waste, ideally for thousands or even hundreds of thousands of years. 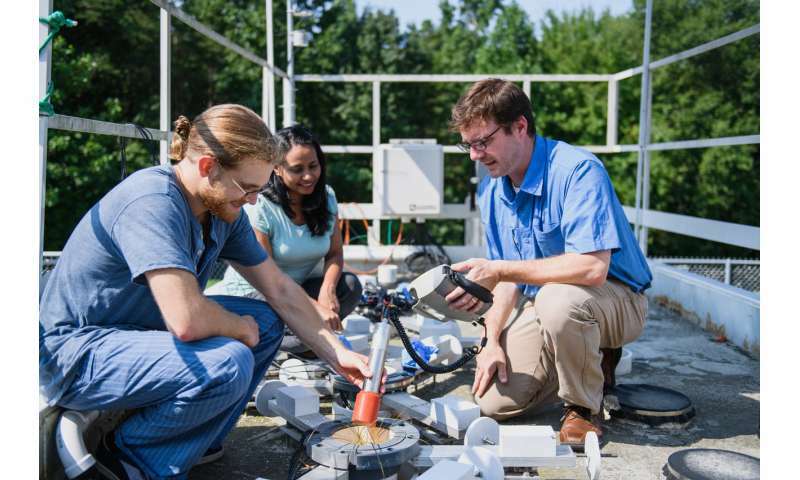 The project, led by Brian Powell of Clemson University, began in 2014 with $5.25 million from the U.S. Department of Energy's Experimental Program to Stimulate Competitive Research, also commonly called by the acronym EPSCoR. "Like every good research project, we started down a path and found some new things out, and that generated more questions than answers," Powell said. "We are grateful to have the renewal period to start pushing out into those additional areas. We're very well equipped and aligned now to continue advancing this project into the renewal phase and continue the work we envisioned four years ago when we started." Fifteen master's students and three Ph.D. students have graduated as a result of the work they have done thus far on the project. The team's members have published 24 articles related to their research on the project and pioneered new ways of using technology developed for medical-imaging to study the movement of radionuclides through soil. Timothy DeVol, the Toshiba Professor of Nuclear Engineering at Clemson, said the team's research will be relevant for years to come. "Being able to safety dispose of radioactive waste for 10,000 years or 1 million years and beyond is of paramount importance to future generations," he said. "This grant allows us to study the fundamental properties that control contaminant fate and transport. Key to this research effort is the ability to scale our results over time and space." "Brian Powell and his team have built a nationally competitive research group that is working in an area critical to human and environmental health," he said. "The team has an impressive record in publishing journal articles and graduating students. The funding renewal is richly deserved." "You have to have a multidisciplinary team to deal with the complexity of disposing of radioactive waste in the environment," Powell said. "We needed to bring in a plant physiologist and a hydrogeologist and a geochemist and a nuclear detection specialist and computational modelers. That's just to name a few. We needed the whole team to do this." One of the highlights of the project so far has been an article titled, "High-Resolution 4-D Preclinical Single-Photon Emission Computed Tomography/X-ray Computed Tomography Imaging of Technetium Transport within a Heterogeneous Porous Media." The article was published in a respected journal, Environmental Science & Technology, and it got a bump in attention when a summary was featured on the website of the U.S. Energy Department's Office of Science. "All the new experiments are designed to have both biological and chemical influences in them with real-time imaging of the water," Powell said. "So, we really are uniting all these concepts we've been understanding in isolation for the first three years. We're really driving the experiments home and getting to the key experiments to see what are the processes that are driving the systems." One of the project's key goals is to build a nationally competitive team of researchers that can get funding independent from the EPSCoR program. The effort to find new sources of funding has already begun, and team members are well positioned to bring in federal grants, Powell said. "The level of funding underscores the quality of research that Dr. Powell and his team are delivering," Gramopadhye said. "Further, the research is creating graduates who are well-equipped with the tools and skills they need to protect human and environmental health. This grant renewal is well deserved."